The second Sunday in April is a special day for golfers and fans, as one of the most important sporting events reaches a decisive stage. The best golfers in the world will come together for the Masters at the venerable Augusta National Golf Club. Ambitious young talents, established tour regulars and golfing legends will compete against each other at the Masters and receive the Green Jacket at the first Major of the season. Since 2008, Mercedes-Benz has been a partner of the Masters, which will be held for the 83rd time this year. Mercedes-Benz ensures exclusive mobility covering all aspects of the Tournament. All the competitors will each have the complimentary use of a GLS or S-Class during the period of the event. The four participating Mercedes-Benz brand ambassadors Bernhard Langer (Germany), Rickie Fowler (USA), Jon Rahm (Spain) and Haotong Li (China) will also have the benefit of a GLE- or G-Class. “All kinds of strength”: with top-class skill, mental strength and determination, each of the four Mercedes-Benz brand ambassadors taking part in the Masters embodies the motto of the new GLE. 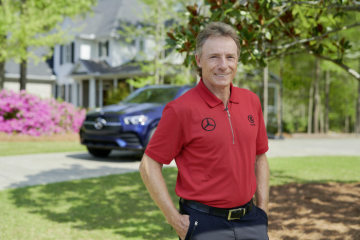 The German golfing legend Bernhard Langer has regularly competed in the Tournament since 1982, and his two victories in 1985 and 1993 secured him a lifelong invitation to the Masters. Born in Anhausen, Langer has achieved more than 110 tournament victories in his impressive career. Rickie Fowler, who secured second place last year, is one of the top favorites for victory in Augusta. In the current season, the 30-year-old has already given weight to his Masters ambitions by winning the Waste Management Phoenix Open at the end of February. Following his debut in 2017, the Spaniard Jon Rahm, who finished in fourth place last year, is once again competing in the Masters. The quartet is completed by the exceptionally talented Haotong Li from China, who is competing in his second Masters. In February 2018, the 23-year-old was the first Chinese player in golfing history to join the top 50 in the world ranking. During the Tournament, golf and automobile fans can enjoy wide-ranging and exclusive content at http://www.facebook.com/MercedesBenzGolf and www.instagram.com/MercedesBenzGolf. Users of the social networks can also exchange views on events at the Masters via the hashtags #PerfectDrive, #MBGolf and #themasters.